There are a number of grants that are available to organisations within the Myall Lakes Electorate. I will announce these on the website, on my Facebook page and in my newsletter. You can contact the office for assistance and information on the application process. Each year the NSW Government funds the Community Building Partnership program which awards a range of grants to incorporated not-for-profit community organisations and local councils. The grants provide funding for the improvement of local community facilities. For more information, visit the Community Building Partnership website. 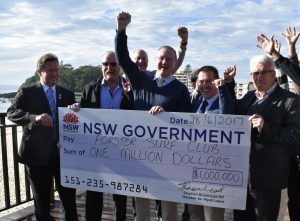 Water Safety Fund Community Grants are being offered to support community efforts to improve water safety in NSW. The Department of Education and Training’s Community Grants include funding for groups involved in promoting community languages, education, Aboriginal community projects and programs assisting disadvantaged youth and people with disabilities. The NSW Department of Sport and Recreation provides grants to nurture sporting talent, help build sport facilities and develop the sector as a whole. For a list of Commonwealth Government grants see the Business.gov website.